Before beginning a juice fast reboot, I was diagnosed with degenerative joint disease. I had severe pain in my right knee and could not walk up or down steps without shooting pain. I was going to physical therapy twice a week—it did not relieve the pain. My doctor wanted to put me on prescription painkillers, but I never filled the prescription. He said if the pain persisted, I would have to have surgery. He never suggested weight loss as a cure. I decided to self diagnose and see if losing weight would help. Watching the movie Fat Sick & Nearly Dead inspired me to try the juice fast reboot. It worked. After losing the first 15 pounds, the pain went away and has not returned. I am now able to run up and down stairs with ease. I was also able to return to walking 3 miles a day and have never felt better! I decided to go RAW after reading the book The China Study . I also read Fit for Life: Not Fat for Life and found it very inspiring. I continue to read everything I can about RAW foods and the benefits of juicing. This keeps me focused on my lifestyle change. I never get tired of hearing compliments about how great I look. I have 10 more pounds to lose and the biggest challenge I have faced is having a wardrobe that doesn’t fit any more because it is too big! It’s fun to go shopping for smaller sizes. 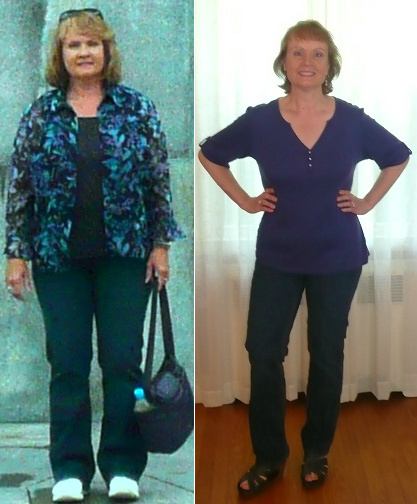 I am amazed that I was able to lose so much weight so quickly and be able to keep it off. Keeping the weight off continues to inspire me! If I can do it, anyone can! I have lost 39 pounds—and gained a whole lot of self confidence. Green juice is the key to my success!